NEWPORT – Oregon scientists, including specialists from Oregon Sea Grant, are examining an unusual fish hauled out of the ocean near Port Orford in a crab pot last week for possible connections to the 2011 Japanese tsunami. 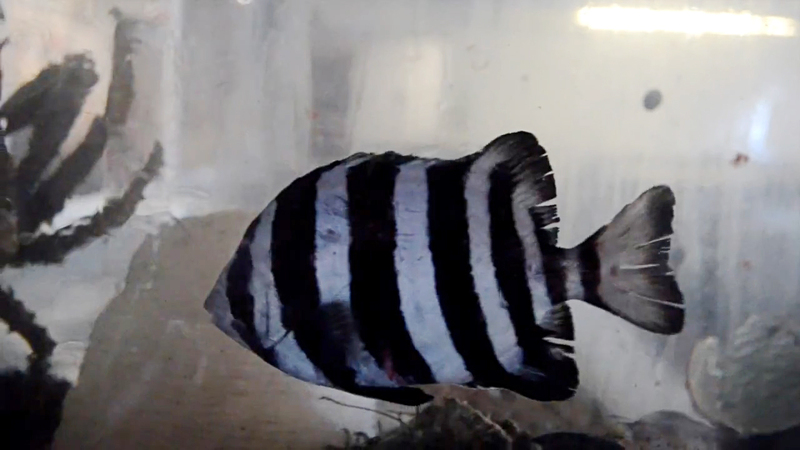 The fish, an Oplegnathus fasciatus (sometimes called a barred knifejaw or striped beakfish) is in quarantine at OSU’s Hatfield Marine Science Center, under the care of OSG aquatic veterinarian Tim Miller-Morgan. While it’s hard to say whether the fish was transported across the Pacific by debris from the 2011 Tōhoku earthquake and tsunami that struck Japan, its appearance in US waters raises questions, according to OSU’s John Chapman, an aquatic invasive species specialist based at the Hatfield Center. Sea Grant invasive species expert Sam Chan estimates the fish to be around 1-2 years old, which makes it unlikely the animal left Japan in 2011. But, he added, “a boat could have been milling around Asian waters for the past 2-3 years and then picked up the fish and ridden the currents over. The big question is – are there more of these.” He said Sea Grant would work with Oregon commercial fisherman, crabbers and others to keep a lookout for more of the species.